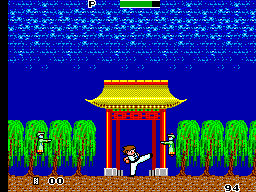 You play as Wang, a kung-fu master (even though he’s only a kid). The concept of this game is to kick the crap out of everything and beat the bad guy Madanda, nothing more than your average SMS storyline. I remember first playing this game when I was younger after renting out from Blockbuster or somewhere. I thoroughly enjoyed it and even managed to complete it. It remained in my memory as I game I liked so it was one of the first I picked up when restarting my SMS collection. Being one of the earlier games for the SMS it was cursed with bog-standard box art and only a 1 mega cartridge. 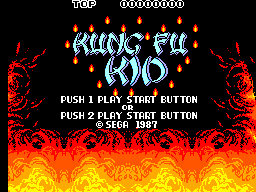 This game is a side scrolling beat-em-up with some elements of a platform game. You just make your way through the level destroying enemies as they come at you using a variety of attacks. 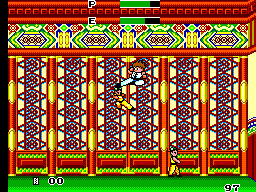 Your moves consist of a standard kick, flying kick, crouching kick (maybe the game should be called The Kickboxer Kid) and some sort of projectile move. You collect these projectiles and health power-ups as you uncover them through the levels. At the end of each level you fight a boss. It’s pretty simple, but enjoyable nevertheless. I did find a glitch in the gameplay you can use to your advantage. There are only 3 enemies on the screen at one time, so if you can get it front of 3 you can make them follow you throughout the level and just stroll though without encountering any more enemies. A note on the gameplay and a handy tip! The graphics in this game are pretty mediocre. The sprites are a decent size and it’s a pretty brightly coloured game which is good. There isn’t much detail though and the backgrounds are not very interesting. There isn’t much in the way of animation either but the game doesn’t suffer from slow-down at any point. I suppose the fiery title screen is quite nice. The sound and music in this game is pretty good, but nothing special. The sound effects only really consist of swooshing kicking and jumping noises. The music fairs better however, as it has a great oriental feel to it and isn’t high-pitched or annoying. Works well with the colourful graphics to make this an all-round upbeat game. One of games best features. The controls are incredibly responsive and it’s easy to pull of the range of attacks. Button 1 is attack and button 2 is jump, simple. Using the directional pad with the attack button pulls of different moves and the jump button can also be used for kicking off walls. Another cool thing I noticed is that if you have rapid fire functions with your pad, jump into the air and use the rapid fire on the kick button to pull of a barrage of kicks so fast it puts Street Fighter’s Chun-Li to shame. Overall, a fairly good game only really let down by some bland graphics and lack of replay value. It’s very easy to pick-up and play so anyone can give it a go. It’s worth owning and considering it’s one of the SMS’s earliest releases, it’s surprisingly fun.